CONCORD, NC – Harley-Davidson® Screamin' Eagle®/Vance & Hines rider Andrew Hines rode a Harley-Davidson® V-Rod® motorcycle to the team's first NHRA National event victory of the season at the Carlyle Tools NHRA Carolina Nationals presented by NAPA Auto Parts at zMAX Dragway. 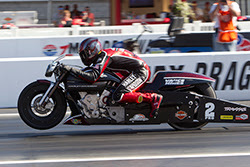 Hines won the event when Lucas Oil Buell rider Hector Arana Sr. fouled at the start in the final round of eliminations. "This was a get-well weekend for the Screamin' Eagle team," said Hines, who won three of four rounds against opponents who fouled at the start. "The fact is I was at the starting line and did my job, and they didn't. That's how it works in drag racing. I had a good bike today with a nice, consistent clutch that gave me great starts." Hines qualified ninth for the event with an Elapsed Time (ET) of 6.924 seconds. Harley-Davidson® Screamin' Eagle®/Vance & Hines rider Ed Krawiec qualified the team's other V-Rod motorcycle in sixth position with an ET of 6.893 seconds. 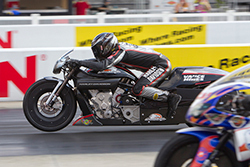 Viper Motorcycle Company Buell rider Matt Smith led all qualifiers with a 6.854-second ET. On Sunday Hines advanced from round one when Viper Motorcycle Company Buell rider John Hall fouled. Hines scored a holeshot win over Matt Smith on the other Viper Motorcycle Company Buell in round two. In round three, Nitro Fish Suzuki rider LE Tonglet fouled at the start to hand Hines a ticket to his first final-round appearance of the season. In the final, Arana Sr. left the line 0.028 seconds early. Hines had a reaction time of only 0.001 seconds and barely avoided his own red-light start. "We figured to win in the final we'd need an outstanding start, so we sped the clutch up a little, and then the air cooled off and I probably had some adrenalin going, so we cut it pretty close," said Hines. Krawiec got a win over Vroom/MBP/LAT Racing Oil Buell rider Mike Berry in round one, but lost to Arana Sr. in the second round. "I had a good bike this weekend and we got the clutching figured out, which is tricky at Charlotte because it has a down-hill start," said Krawiec, the defending Pro Stock Motorcycle champion. "We just didn't have enough for Hector in the second round. We lost a little ground to the leader in the points race, but gained on the bunch right ahead of us. We are in a good position to move up in the standings next week." The Charlotte event was the first of six in the NHRA Countdown to the Championship playoffs, which includes Krawiec and nine other riders who qualified to race for the title after the first 10 races of the season. Krawiec was seeded seventh for the Countdown, and he maintains that position following the Charlotte weekend. Lucas Oil Buell rider Hector Arana Jr. leads the Countdown with 2,183 points. Smith is second with 2,150 points, followed by Arana Sr. with 2,147 points. Krawiec has 2,085 points. Hines did not qualify for the Countdown. The NHRA Countdown the Championship resumes September 19-22 at the 28th annual AAA Texas NHRA FallNationals at the Texas Motorplex in Ennis, Texas.